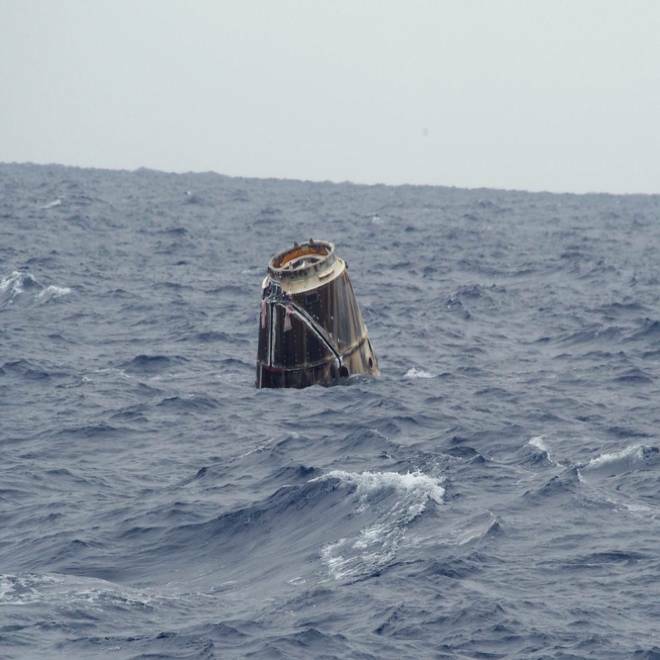 The Dragon space capsule returned to Earth from the International Space Station, capping off its historic mission with a splashdown in the Pacific Ocean. NBC's Mark Barger reports. SpaceX's Dragon cargo capsule parachuted to a picture-perfect splashdown in the Pacific Ocean today, ending the first-ever commercial mission to the International Space Station. The gumdrop-shaped Dragon made history last week as the first U.S. craft to reach the orbital station since last year's retirement of the space shuttle fleet, and it made history today as the first commercial craft to return a shipment from orbit. SpaceX's 40-year-old billionaire founder, Elon Musk, told reporters that the nine-day space station resupply mission was "like a grand slam" in baseball, and repeatedly voiced joy and surprise at how well it went. "There are a thousand ways that it could fail, so this may sound sort of odd, but when you see it actually work, you're sort of surprised," he said. The 14.4-foot-high (4.4-meter-high) capsule came down about 560 miles west of Baja California, within a mile of its target point, Musk said. When he saw the first pictures of the craft bobbing in the Pacific, he said his reaction was, "Welcome home, baby. ... It's like seeing your kid come home." A photo from SpaceX shows the Dragon spacecraft floating on the surface of the Pacific Ocean about 500 miles west of Mexico's Baja California today. The demonstration flight will almost certainly earn a go-ahead for SpaceX to start space station resupply missions in earnest under the terms of a $1.6 billion contract with NASA. Alan Lindenmoyer, manager of NASA's commercial crew and cargo program, said a few more items needed to be marked off on the list of criteria, but he voiced nearly as much satisfaction about the results as Musk did. "It is very easy to see that this satisfies, I believe, 100 percent of those criteria," he said. The demonstration flight began on May 22 with the Dragon's launch from Cape Canaveral Air Force Station in Florida, atop a SpaceX Falcon 9 rocket. The mission reached its climax last Friday when astronauts used the space station's robotic arm to pull the Dragon in to its docking port on the the station's Harmony module. On the following day, when station crew members entered the Dragon for the first time, NASA astronaut Don Pettit gushed over its new-car smell. Over the days that followed, the station's crew unloaded a half-ton of food, equipment, experiments and other supplies — then loaded it back up with more than 1,300 pounds (620 kilograms) of non-essential Earth-bound shipments. Today, astronauts reversed the process they went through last week. The robotic arm pulled the Dragon out from its port and positioned it for release at 5:49 a.m. ET. SpaceX's craft then executed a series of engine burns to take itself out of the station's neighborhood and descend from orbit. The final engine burn slowed the Dragon's orbital velocity by 100 meters per second (224 mph) — enough to drop it into a fiery descent through the atmosphere. The craft's bottom is coated with a layer of protective material called PICA-X, which SpaceX's engineers say is resilient enough to weather a return to Earth from Mars. At its peak, the heat shield had to endure temperatures in excess of 3,000 degrees Fahrenheit (1,650 degrees Celsius). The suspense built during a few minutes of scheduled communication blackout, but eased when infrared imagery from airplanes circling the projected splashdown site showed the Dragon's parachutes opening. For some observers, the sight of the red-and-white main parachutes sprouting from the capsule sparked a flashback to the days of the Apollo moonshots. A photo taken from a recovery ship shows the SpaceX Dragon's parachutes floating in the air after the cargo craft's splashdown. At 11:42 a.m. ET, SpaceX's controllers confirmed that the craft made a successful splashdown. NASA mission commentator Josh Byerly observed that the Dragon mission "ended like it began — which is, fairly easily." A pre-positioned flotilla of recovery ships loaded up the Dragon and will bring it back to Los Angeles, near SpaceX's headquarters in Hawthorne, Calif. Some high-value experimental payloads will be express-delivered to NASA within 48 hours; however, the bulk of Dragon's cargo will be taken off after it's transported to SpaceX's rocket test facility in MacGregor, Texas. This particular Dragon won't be reused for another NASA flight, but eventually SpaceX plans to refurbish the capsules as well as rocket stages. Over the past few years, NASA has paid out about $300 million to help SpaceX develop the Dragon and the Falcon 9 rocket. SpaceX has invested a similar amount of its own capital. This test mission should clear the way for SpaceX to start in on the $1.6 billion station resupply contract, which covers 12 flights through 2015. Musk said he expected the first full-fledged Dragon cargo run to lift off late this summer. Another company, Virginia-based Orbital Sciences Corp., is working on an alternate commercial delivery system, but that system hasn't yet gone through flight testing. Such deliveries are part of NASA's grand plan in the post-shuttle era to transfer space station resupply operations to commercial companies, at what is expected to be a cost far less expensive than space shuttle operations. Theoretically, that would free up money for NASA to concentrate on developing a more powerful heavy-lift rocket and a more capable Orion spacecraft for missions beyond Earth orbit — heading toward asteroids, the moon and eventually Mars. SpaceX and three other companies — Blue Origin, the Boeing Co. and Sierra Nevada Corp. — are working on spacecraft capable of transporting astronauts to and from the station, and NASA expects those ships to be available for its use by 2017. SpaceX's crew-carrying craft will be an upgraded version of the Dragon that was used for the current cargo mission. Musk said Dragon 2.0 would have a thruster system capable of making near-pinpoint, helicopter-style landings. That system is due for testing later this year, and could be ready for NASA in three to five years. Such a system would be a must-have for landings on other worlds, Musk noted. Musk, a dot-com billionaire who made his fortune with PayPal, founded SpaceX in 2002 as part of his own grand plan to help humans get to Mars and become a "multiplanet species." Today he noted that the company, known more formally as Space Exploration Technologies Corp., is under contract for about 40 launches, including the 12 planned Dragon cargo missions for NASA as well as additional commercial launches. Just this week, SpaceX announced a deal with Intelsat to put a telecom satellite into geosynchronous transfer orbit using the Falcon Heavy rocket, which is still under development. SpaceX also hopes to win some launch contracts for the Falcon Heavy from the U.S. military. Some veteran observers of the space effort, including Apollo moonwalkers Neil Armstrong and Gene Cernan, have been critical of NASA's move toward commercialization. Cernan, for example, complained to Congress that commercial space companies "don't know what they don't know." But Musk said the Dragon mission demonstrated that "commercial spaceflight can be successful." He voiced hope that SpaceX's efforts would inspire a new generation of engineers and explorers. "We're really at the dawn of a new age of space exploration, where there's going to be a huge amount of opportunity and a lot of exciting things happening," Musk said. NASA Administrator Charles Bolden expressed similar sentiment in a post-splashdown statement: "This successful splashdown and the many other achievements of this mission herald a new era in U.S. commercial spaceflight. American innovation and inspiration have once again shown their great strength in the design and operation of a new generation of vehicles to carry cargo to our laboratory in space. Now more than ever we're counting on the inventiveness of American companies and American workers to make the International Space Station and other low-Earth-orbit destinations accessible to any and all who have dreams of space travel." This item was last updated at 4 p.m. ET.